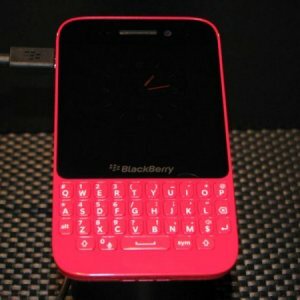 Smartphone maker BlackBerry seems to have lost more than just market share to its more nimble rivals Apple and Samsung. It seems the Canadian firm has also lost sense of what works – and what doesn’t. How else would you explain the fact that it is targeting boys for the pink variant of its entry-level QWERTY Q5 smartphone? In a media note sent today, BlackBerry says the pink BlackBerry Q5 smartphone is now available at all leading electronic stores in the UAE. Great. But that isn’t all. The company says that “[t]o celebrate the launch of the new color, we’ve come up with five fun facts about the color pink”. The first of those facts takes us back to the 19th century when the colour pink wasn’t associated with girls but with boys… “Did you know that the color pink was not always associated with femininity? In the 19th century, pink was associated with boys as it was considered a “stronger” color as compared to blue,” states the BlackBerry missive and for what it’s worth, also credits a source, the Smithsonian Mag for it. Apple Incs iPhone 5S and 5C - Citius, Fortius, Vilius?